This is a venturi action top skimmer or bottom cleaner. Removes bugs, debris and leaves which can clog pond filtration. Works with a garden hose. Filter bag slips on and off quickly. 1 year warranty from date of purchase. I've used one of these for several years to clean swimming pools. With the provided bag, it works to pick up small sticks and heavy leaf accumulation, but without the optional silt bag, if there is a lot of fine dirt or sand in the pool or pond, it won't take long before all the fine debris is stirred up to the point where you will lose sight of the bottom and what you're trying to pick up. 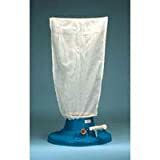 If you hav a lot of dirt or sand in the pool or pond, you WILL be wishing you had gotten the optional silt bag. The really fine silt passes through the silt bag enough to cloud the water, but the silt bag will allow the leaf eater to pick up and hold most of the dirt and sand leaving only the finest debris behind. As supplied, I'd give the leaf eater 4 out of 5 stars. If it came with the silt bag IN ADDITION TO the leaf bag at NO additional charge, that 4 star rating would improve to a 5 star rating. Only problem with the optional silt bag is that if there is a lot of fine silt, the water flow may reduce forcing you to empty the bag before the bag is actually full just to restore the water flow enough to pick up the leaves. Best method, FIRST clean bulky debris (leaves, etc.) 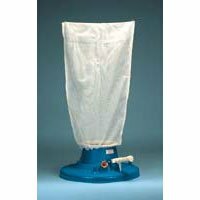 with provided mesh bag, then, if you don't have a vacuum to hook up to a pump to pull silt out of pool/pond, switch to silt bag to remove the fine silt.